Born in 1939, Pamela Kay worked as a freelance textile designer after graduating from the Royal College of Art and Canterbury School of Art. In 1983, Pamela turned to painting full time and has exhibited regularly in a long and distinguished career. Working in both oils and watercolour, and occasionally in pastel, her subject matter ranges across still life, flowers, interiors, and gardens. She combines a consummate artist’s eye with the knowledge of an expert plants woman, and her still lifes display a lightness of touch, a mastery of colour and composition and the quality of draughtsmanship. She travels extensively and has worked in the Far East, the Mediterranean and the Baltic. 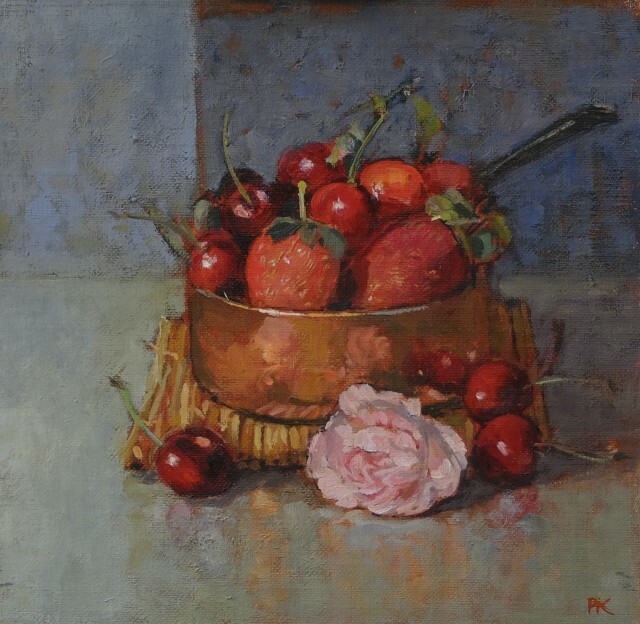 Pamela Kay has exhibited regularly at the Royal Academy Summer Exhibitions since 1959 and her work has been shown in galleries across the country. In 1984 she was made a Member of the Royal Society of British Artists, followed by membership of the New English Art Club in 1985 and of the Royal Society of Watercolour Painters in 1986. She is a regular contributor to the ‘Leisure Painter’ and ‘The Artist’ magazines and her work has also appeared in a wide range of publications and books.